New Swears were formed in our nation's capital back in 2012 and have been delivering a quirky brand of power-pop rock ever since. Recently, the group stopped by Toronto's Boots & Bourbon Saloon to play a few songs for Exclaim! No Future. Why a country bar? Well, we knew the band perform stunts while playing, including climbing fire escapes and getting food mid-set, so we found a mechanical bull for them. Guitarist/vocalist Beej Eh told Exclaim! last year that they had been working at perfecting their live show, and trying to "kick it up a notch." We thought we would give them a chance to prove their word. The group played "Two Darts" from 2013's Funny Isn't Real, "Midnight Lovers" from 2015's Junkfood Forever, Bedtime Whatever and "Dance with the Devil" from their 2017 album And the Magic of Horses. 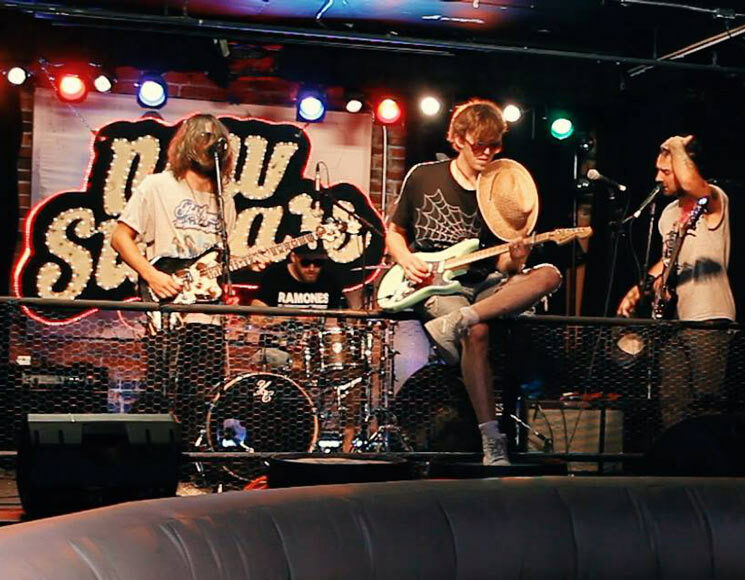 Check out these goofy party-punk rockers in the players below, but first check out the "Road to Riverfest Tour" dates they're doing around the Riverfest Elora festival.